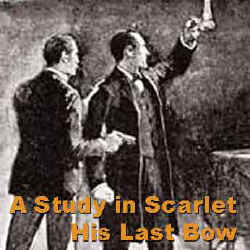 The first Sherlock Holmes novel written by Arthur Conan Doyle, "A Study in Scarlet" was published in 1887. This unabridged reading is performed by Patrick Horgan. Format mp3 file by chapter for download ~ 227 MB zip file. Dr. Arthur Conan Doyle had been turning over in his mind the thought of an entirely new kind of detective fiction which would shun the customary intricate web of coincidences which previous writers had relied on. He decided to focus more on the personality of the detective. His model was one of his Professors at Medical School in Edinburgh, Dr.Joseph Bell, who was able to tell at a glance the line of work of his new patients. The result was "A Study In Scarlet" which appeared in the Christmas Beeton's Annual in December 1887. The issue sold out, though the occasion was not marked by any great fanfare. An original copy is now beyond price. The book begins with the first meeting between Dr. Watson, and the soon to be famous young Sherlock Holmes, and their decision to take rooms together in Baker Street. Almost at once we have Holmes pointing out that a man in the street is an ex Marine Sergeant. When he comes to their house with a message, Watson decides it is time to put down his bumptious new friend, and asks the visitor what he did before he became a Commissionaire. "A sergeant, sir, Royal Marine Light Infantry, sir" is the reply. Poor Watson! Holmes is already far enough advanced in his career to be consulted by the two most lively detectives at Scotland Yard, Gregson and Lestrade, about the mysterious killing of an American in Brixton Road. It takes our hero just four chapters to arrest the villain. The second half of the book consists of a long flashback among the Mormons in America which records the events which led up to the tragedy of the first part. Then, returning to the present, the murdererr explains how and why he did it, and the finale has the usual Holmesian analysis of his deductive processes. As he predicted Inspectors Lestrade and Gregson take all the credit, much to his disgust.